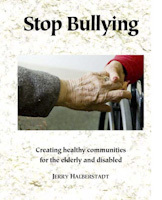 The Stop Bullying Coalition advocates for new legislation protecting elderly and persons with disability from bullying, mobbing, and hostile environment harassment in multifamily subsidized and public housing. 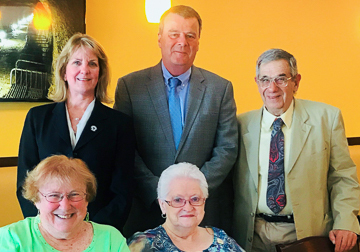 We recently were honored to meet with our elected representatives, Senator Joan Lovely (2nd Essex) and Representative Thomas Walsh (Peabody), to advocate for consideration of our proposed legislation designed to address two critical needs of tenants who are elderly or living with disability, and reside in public or subsidized housing, and are victims of bullying. Both Senator Lovely and Representative Walsh were attentive, responsive, and demonstrated their experience and concern with the problems of assuring peaceful enjoyment in housing—the right to be free of interference and harassment in one’s home. In a statewide survey (1) of 617 residents and staff of public and subsidized housing, almost half reported being bullied. An estimated 29% of respondents live in housing communities where the respondent is bullied and observes others being bullied. Many do not even seek a remedy because they fear retaliation if they complain. Only 16% of victims of bullying who seek help report they get a successful resolution. Although more than half of survey respondents were not bullied, only an estimated 30% are in bully-free communities where they also don’t observe others being bullied. Today, all across the Commonwealth, elderly persons and persons with disability are harassed and bullied in their homes—in multifamily residential settings including public and subsidized housing. And there is no real protection. No one is empowered to investigate and protect all victims. Although the landlord is legally obligated to assure “peaceful enjoyment,” some landlords fail in this duty and there is no accountability. At every level of society and even in the highest levels of government, we see evidence of the lack of social control that leads to sexual abuse, bullying, and mobbing, and that extends to harm the elderly and people with disability even in their homes. We need initiatives to address these problems. We need to empower tenants and give protection and relief to victims of bullying. the tenant leadership of the Mass Union of Public Housing Tenants gave unanimous support for our legislative advocacy in their recent convention. to refer situations of hostile environment harassment and mobbing for possible civil prosecution by the Attorney General or the District Attorneys, under existing law for the protection of the rights of citizens. In addition, but not included in this bill, the Commonwealth should support programs of research, education, training, and prevention. HELP WANTED: OPPORTUNITY FOR ATTORNEY OR LAW STUDENT. VOLUNTEER TO BE PART OF HISTORY, PREPARE FINAL DRAFT OF THE BILL TO MEET LEGISLATIVE STANDARDS. Contact us to apply. New legal remedies in the works! There are three legislative proposals in the works, including a bill of Representative Alan Silvia, and recommendations by the Commission on Bullying which may be filed as a bill at some later date, as well as our new legislation, the "Stop Bullying Bill." On behalf of the Stop Bullying Coalition, Halberstadt has been working with Representative Silvia on our common interests in protecting elderly tenants from bullying. As Commissioner, Halberstadt contributed to and approved the legislative proposal put forward by the Commission on Bullying, a proposal which grew out of the first bill on the topic which he filed "by right" in 2013. Each of these bills and proposals addresses aspects of the problem of bullying, and offers different solutions. They are complementary approaches to the problem. We believe that our proposal, the Stop Bullying bill, based on the Commission findings and our extensive research, is not the whole answer, but it is an essential part of the solution. Therefore, we ask you to join us and advocate for our new legislation, the "Stop Bullying Bill," protecting elderly and persons with disability from bullying, mobbing, and hostile environment harassment in multifamily subsidized and public housing. We rely on the elected senators and representatives on Beacon Hill to determine the best path forward. We respect that it is the job of the General Court to evaluate all proposals and to make the most appropriate decision. They may decide to include elements of each proposal, accept one proposal or more than one proposal, or reject them all. That, after all, is the democratic process in our Commonwealth. We welcome your ideas and your experience. Tell us your ideas so we can strive to make change that will work in your life. Do you agree this legislation will help? What would you change in the bill? We began with a handful of concerned citizens, just two people living in subsidized and public housing, and one with decades of experience in advocacy. From this humble beginning, in partnership with our legislators including Senator Joan Lovely and Representative Brad Hill, Representative Kevin Honan, and many other sponsors and supporters including Mary Margaret Moore and the Independent Living Center of the North Shore and Cape Ann, and Susan Bonner, Legislative Chair of the Mass Union of Public Housing Tenants, we have created a statewide coalition. Our strength came from those victims like "Margaret" who had the courage to speak out, even if they were made homeless in retaliation. Together, we passed the law to create the Commission on Bullying, and soon we hope to see effective new laws based on our work and the work of the Commission, and from concerned legislators including Representative Alan Silvia. And we need now to strengthen our statewide coalition to assure our continuing progress. You are invited to join us! We may be elderly, we may be living with disability, but we have skills, experience, and passion, and we still matter. Democracy gives each of us power—the right to advocate, and the right to vote. We need your help as well as your advice. Please reach out to your network to spread this message. A help line with rapid intervention to investigate and protect victims. Accountability for landlords: they must assure peaceful enjoyment. (1) Jerry Halberstadt and Marvin So, Statewide Survey on Bullying of Tenants in Public and Subsidized Multifamily Housing. (2) Commission to Study Ways to Prevent Bullying of Tenants in Public and Subsidized Multifamily Housing, pursuant to Chapter 2 of the Resolves of 2016. (3) Bullying, mobbing, and hostile environment harassment are behaviors which may result in stress and serious physical or emotional injury to elderly persons, and restrict their rights. Bullying or harassment is any mode of communication used by one or more perpetrators to hurt and demean the target or victim, and/or to mobilize members of the community to use gossip, social pressures, and isolation, often in order to control or exclude the target from common areas of the residential setting, and sometimes to “get rid of” or cause the target to be evicted. For more definitions related to this issue, please see copy of the bill.